Authorize BY CHECKING THIS BOX, I AUTHORIZE BATTISTELLA DEVELOPMENTS TO PROVIDE ME WITH INFORMATION ELECTRONICALLY. BATTISTELLA DEVELOPMENTS WILL NOT SELL OR MAKE YOUR PRIVATE INFORMATION TO ANY THIRD PARTY. Ready to begin your East Village adventure? 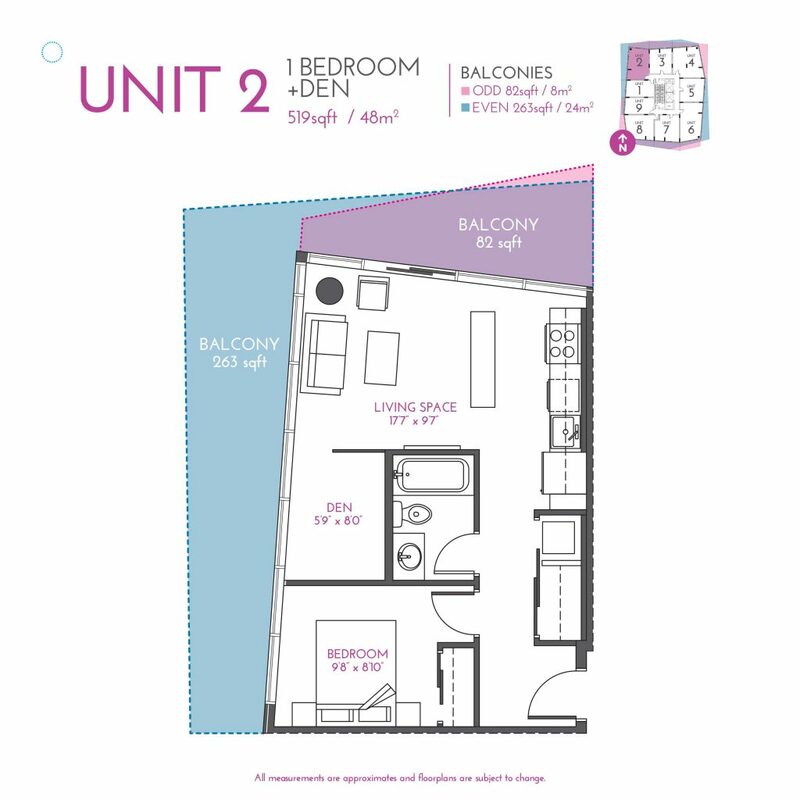 The corner one bedroom plus den plan is the perfect launch pad for your busy downtown life. Designed with 519 sq ft of interior space and up to 263 sq ft of additional balcony space (only available on wrap-around balconies; only two homes remaining), I love this plan because it has achieved the perfect balance of flow and division of space. Whether you are running in for a quick outfit change before an evening event or catching up on a TV series while meal prepping for the week, moving within the space is made effortless and easy. Kick off your shoes and enter the unit, storage and laundry follows to your right leading you into the kitchen while, to your left, the bedroom and bathroom sit side by side. Nine-and-a-half-foot-high ceilings maximize volume, storage, and interior design possibilities, and the large windows fill the space with tons of natural light and let you peer out over your new East Village playground. The living room stretches out in the northwest corner of the unit, surrounded by floor-to-ceiling glass that runs the entire length, including throughout the den and bedroom. Back down the hall, the bedroom gives you plenty of size for your cozy queen bed. Tons of windows help you rise and shine, and the closet comes with a pre-installed organizational unit and space-saving sliding doors.The grey-toned, linear kitchen sits immediately adjacent to the living room, making it easy for you multi-task in the kitchen or grab a quick brew from the fridge while you kick-up your feet for the night. Full-sized appliances, including five burner stove and convection oven, 19 cu.ft fridge, dishwasher, and front-load stacking washer and dryer, keep the space functional and save you time. The bathroom is right next to the bedroom, meaning fewer steps as you rush to get ready for work in the morning (that third snooze was totally worth it), and your morning routine is made easy with a full-sized tub and shower, and tons of storage for your beauty regime (because who really #wokeuplikethis). Not least of all is the cleverly placed den. Tucked beside the living room, running along the floor-to-ceiling glass windows, this den easily makes the plan one of my favorite layouts. Large windows fill the den with light, making it perfect for a home office, an artist space, a yoga studio, or a temporary guest bedroom; whatever you use if for, you’ll have plenty of space to breathe. Although the layout and flow of the plan are among the reasons it hits top marks for me, there are so many other features present in INK that make these homes perfect for inner-city life. I can imagine so many different lifestyles fitting comfortably into this home and I am always excited to meet customers who love it just as much as I do! Want to find out more about this plan and the only two remaining wrap-around balconies? Give us a shout at 403.452.9268 or visit us at our East Village sales centre for more information.